Why isn’t a rule meant to make government spending more transparent being enforced? Despite an ethics rule that requires outside lobbyists for taxpayer-funded entities to submit lobbying contracts to the Florida House, that rule has not been enforced. House Speaker Richard Corcoran, R-Land O'Lakes. If you want to know how much your local government is spending on private lobbyists to lobby the Legislature, the Florida House has a web page devoted to disclosing it. But though House Speaker Richard Corcoran promised the web page would provide "transformational" transparency, the House forgot one thing: to post all the data. Records obtained by the Times/Herald show that despite an ethics rule that requires lobbyists for taxpayer-funded entities submit lobbying contracts to the Florida House, that rule has not been enforced. The House's much vaunted web page was not updated for a year and some lobbyists neglected for months to comply with the required disclosures. Today, the web page still includes outdated data on lobbying expenditures made by local governments and remains incomplete. At one point, the backlog left hundreds of documents off the books in the last two years, despite Corcoran's claim. "The ball was dropped somewhere along the line,'' said Rep. Larry Metz, the Yahala Republican who chairs the House Public Integrity and Ethics Committee that is supposed to maintain the web page and enforce the rule. 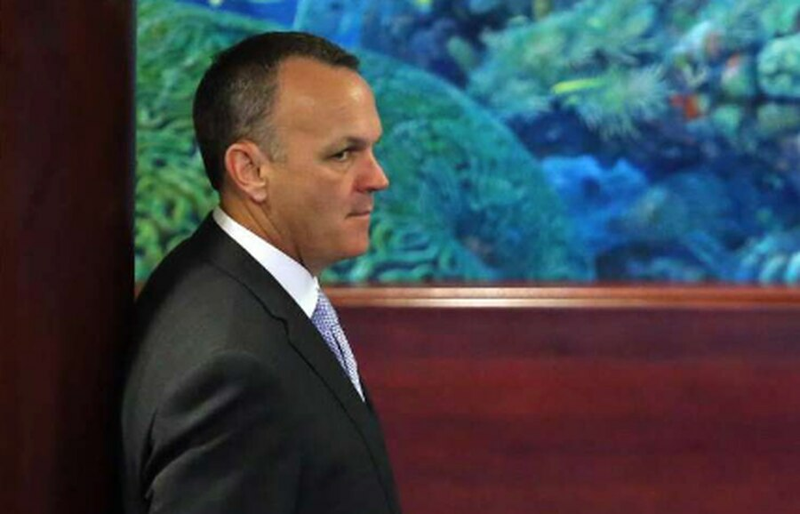 Corcoran, a Land O'Lakes Republican, announced Wednesday that he would not be running for governor as he had long planned. He has said the House lobbyist disclosure rules and his other ethics initiatives are among the most important achievements of his eight years in office. In November 2016, the House passed the rule requiring lobbyists contracting with all local governments and taxpayer-funded entities to disclose those contracts with outside lobbyists. "It's a disgrace that taxpayer dollars are used to hire lobbyists when we elect people to represent them," Corcoran said at the time. "The state doesn't do it, and neither should the locals." Though the contracts are already public record, Corcoran said the new rule would ensure contracts would be posted publicly on a single web page, allowing taxpayers to see who profited the most from public money. But while House staff initially uploaded all the contracts it received from lobbyists, "it was not carried forward,'' Metz said. Corcoran did not respond to a request for comment. During his tenure, he pushed through a raft of other ethics changes after he became speaker, banning members from riding on lobbyists' planes, prohibiting texting on the House floor, and extending a ban on lobbying by former House members from two to six years. Corcoran initially attempted to ban all taxpayer-funded lobbying by private firms, but after opposition from members, he instead pushed through the ethics rule requiring that the contracts be submitted regularly to the House. Enforcing and maintaining the contracts rule, however, fell by the wayside in the months after the contract disclosure requirement was adopted in November 2016. Lobbyists are supposed to submit the contracts directly to the committee in a "scout's-honor" system, at the same time that they register to lobby for a public entity on an issue or bill. House staffers are then supposed to check the documents to ensure they contain the information required by the ethics rule before posting them. But after April 2017, updates to the public database stopped. Records show lobbyists kept emailing in contracts, but hundreds of documents — more than 350 — piled up without review. Though the committee is not explicitly required to post the contracts online, it relies on outside complaints to investigate any violations of the rule. But committee staffers do not independently check to make sure lobbyists who have registered on behalf of a public entity submit the contract as required — and without an updated public database, lobbyists and the public have no way to know who adhered to the ethics guideline or call out anyone who didn't. "We're not in the business of trying to seek out and find violations," Metz said, comparing it the Florida Ethics Commission, which can act only when it receives a complaint. "If we're told someone is not complying, we're going to take that under advisement and act accordingly." The House rolled out informational sessions and FAQs for lobbyists when the rule took effect, but its light oversight meant some lobbyists forgot for months to comply with the rule. They did not even receive a reprimand. When lobbyist Lane Stephens secured a contract to represent the city of Quincy last December, he filed as he usually does to lobby for one of his private clients. But he forgot to submit the Quincy contract to the House committee until Feb. 28. No one reminded him submitting the contract was required. "When I submitted lobbyist registration forms, I didn't get anything back saying, 'By the way, remember this is a city or a local government so you have to submit this contract to the House,'" he recalled, though he conceded he should have been aware of the rules. He realized his error when he was on the House website checking the lobbyist disclosure page for a different reason. When asked if he was aware of other lobbyists who had not submitted contracts on time, Stephens said he was not and implied he wouldn't be interested in checking others' records anyway. "I got my own business to take care of," he said. "I don't worry about theirs." The data that is currently required for the web page still includes major gaps. For example, it discloses only the primary lobbyist a city or county has hired. High-powered lobbying firms often hire a sprawling web of subcontractors to do additional consulting, but that information does not have to be disclosed to the committee. After the Times/Herald inquired about the database last month, the committee finished uploading the remaining lobbying contracts for the 2017 session. But two months after the 2018 session ended, those contracts — about 170 — have yet to be posted. House staff is determining how to best update the website and distinguish between documents from year to year, Metz said. The rules could change when Rep. Jose Oliva, R-Miami Lakes, becomes speaker in November. Oliva said he had not yet had conversations about the next session's House rules, but that he personally supported the requirement to continue disclosing public contracts. "We discussed that a great deal before putting it in the rules — more information and greater transparency is usually better," he said. "As Rules chair, I helped craft a lot of this and of course I voted for it. The only thing we have to look at is, did anything have an adverse effect than it intended?" Metz said the committee still intends to proceed with updating the system and avoid future backlogs. "I'm optimistic about the system that we've started with this term," he said. "The foundation is in place for a very robust disclosure system to be accessed by the public in real-time."